Browse: Home / Does foreign aid always help the poor? There was a strong economic and political argument for helping poor countries, too. In the mid-20th century, economists widely believed that the key to triggering growth — whether in an already well-off country or one hoping to get richer — was pumping money into a country’s factories, roads and other infrastructure. So in the hopes of spreading the Western model of democracy and market-based economies, the United States and Western European powers encouraged foreign aid to smaller and poorer countries that could fall under the influence of the Soviet Union and China. The effect wasn’t limited to Africa. 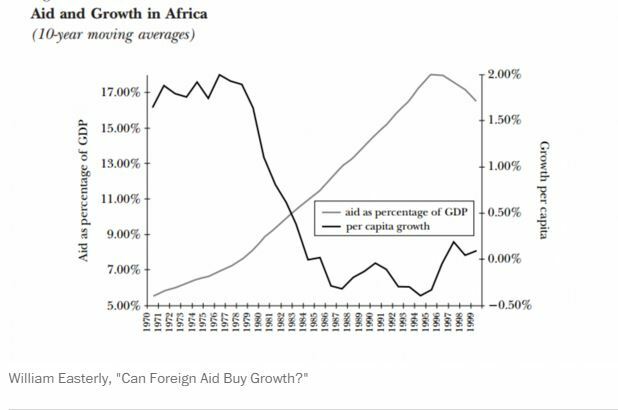 Many economists were noticing that an influx of foreign aid did not seem to produce economic growth in countries around the world. Rather, lots of foreign aid flowing into a country tended to be correlated with lower economic growth, as this chart from a paper byArvind Subramanian and Raghuram Rajan shows. The countries that receive less aid, those on the left-hand side of the chart, tend to have higher growth — while those that receive more aid, on the right-hand side, have lower growth. Why was this happening? The answer wasn’t immediately clear, but Deaton and other economists argued that it had to do with how foreign money changed the relationship between a government and its people. Think of it this way: In order to have the funding to run a country, a government needs to collect taxes from its people. Since the people ultimately hold the purse strings, they have a certain amount of control over their government. If leaders don’t deliver the basic services they promise, the people have the power to cut them off. It might seem odd that having more money would not help a poor country. Yet economists have long observed that countries that have an abundance of wealth from natural resources, like oil or diamonds, tend to be more unequal, less developed and more impoverished, as the chart below shows. Countries at the left-hand side of the chart have fewer fuels, ores and metals and higher growth, while those at the right-hand side have more natural resource wealth, yet slower growth. Economists postulate that this “natural resource curse” happens for a variety of reasons, but one is that such wealth can strengthen and corrupt a government. The United States gave aid to Ethiopia for decades under then-President Meles Zenawi Asres, because he opposed Islamic fundamentalism and Ethiopia was so poor. Never mind that Asres was “one of the most repressive and autocratic dictators in Africa,” Deaton writes. According to Deaton, “the award for sheer creativity” goes to Maaouya Ould Sid’Ahmed Taya, president of Mauritania from 1984 to 2005. Western countries stopped giving aid to Taya after his government became too politically repressive, but he managed to get the taps turned on again by becoming one of the few Arab nations to recognize Israel. Some might argue for bypassing corrupt governments altogether and distributing food or funding directly among the people. Deaton acknowledges that, in some cases, this might be worth it to save lives. But one problem with this approach is that it’s difficult: To get to the powerless, you often have to go through the powerful. Another issue, is that it undermines what people in developing countries need most — “an effective government that works with them for today and tomorrow,” he writes. There are lot of places around the world that lack good roads, clean water and good hospitals, says MIT’s Acemoglu: “Why do these places exist? If you look at it, you quickly disabuse yourself of the notion that they exist because it’s impossible for the state to provide services there.” What these countries need even more than money is effective governance, something that foreign aid can undermine, the thinking goes. Some people believe that Deaton’s critique of foreign aid goes too far. There are better and worse ways to distribute foreign aid, they say. Some project-based approaches — such as financing a local business, building a well, or providing uniforms so that girls can go to school — have been very successful in helping local communities. In the last decade, researchers have tried to integrate these lessons from economists and argue for more effective aid practices. Many people believe that the aid community needs more scrutiny to determine which practices have been effective and which have not. Economists such as Abhijit Banerjee and Esther Duflo, for example, argue for creating randomized control trials that allow researchers to carefully examine the development effects of different types of projects — for example, following microcredit as it is extended to people in poor countries. Deaton’s critiques of foreign aid stem from his natural skepticism of how people use — and abuse — economic data to advance their arguments. The science of measuring economic effects is much more important, much harder and more controversial than we usually think, he told The Post. Deaton doesn’t argue against all types of foreign aid. In particular, he believes that certain types of health aid – offering vaccinations, or developing cheap and effective drugs to treat malaria, for example — have been hugely beneficial to developing countries. But mostly, he said, the rich world needs to think about “what can we do that would make lives better for millions of poor people around the world without getting into their economies in the way that we’re doing by giving huge sums of money to their governments.” Overall, he argues that we should focus on doing less harm in the developing world, like selling fewer weapons to despots, or ensuring that developing countries get a fair deal in trade agreements, and aren’t harmed by U.S. foreign policy decisions. This article is published in collaboration with Washington Post. Publication does not imply endorsement of views by the World Economic Forum. Author: Ana Swanson is a reporter for Wonkblog specializing in business, economics, data visualization and China. Image: People carry food aid distributed. REUTERS/Antonio.